Pure Bliss Desserts, nestled in downtown Bellingham, is known for serving high-quality desserts. Made-from-scratch desserts such as cakes, cookies, tortes, tarts and other goodies line the glass cases, and beverages including coffee and espresso, wine, beer and mead are ready to be poured. This is the kind of place you can fall in love with. 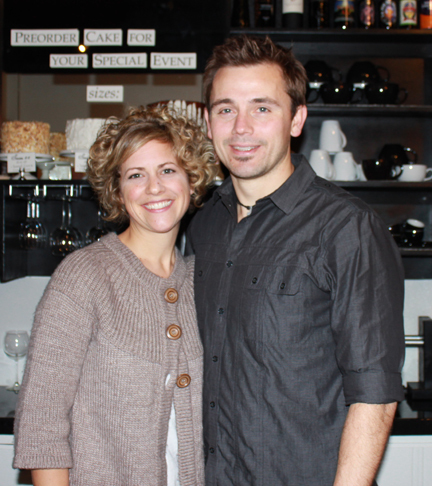 Having celebrated their first anniversary last fall, owners Andi and Nick Vann say that having their own small business based around baking is a dream come true. Their catering business utilized the kitchen space in what is now Pure Bliss Desserts, although back then it was a cafe. After two and a half years, the pair were anxious to start their own bakery, specializing in desserts. “We used to imagine what our storefront would look like,” Andi remembered. When the cafe closed, the landlord offered the Vanns the space and they were delighted to accept. “We had just returned from a trip to Italy,” Andi said, noting that they were fixated on the beautiful storefronts they saw while abroad and were excited to finally have their own. Nick’s participation is also somewhat limited by his career as a firefighter, although he is always helping at the store. “He is our ultimate stand-in for when none of our employees can work,” Andi said. Although they are excited to have their own business, the duo have experienced obstacles along the way. They recognize the state of the economy and how their business may be effected but they are also taking measures to ensure that Pure Bliss Desserts stays intact. Andi’s father is very knowledgeable about small business, and they are grateful to have him as a guide, since neither of them have marketing backgrounds. They feel fortunate to have a business in Bellingham, noting the public reaction has been very positive and they recognize that belonging to such a tight-knit community is part of their success. During the month of January, Pure Bliss is offering $2 lattes and other specials, and will gear up in February for Valentine’s Day, a popular holiday last year. In addition to their varied selection of cakes and other treats, the bakery offers wedding cakes and accept orders for other special events. Pure Bliss is located at 1424 Cornwall Avenue in downtown Bellingham and can be reached at (360) 739-1612. Shop hours are Mondays noon to 6 p.m. and Tuesdays through Saturdays noon to 10 p.m. For more information, visit pureblissdesserts.com. Such wonderful people! I have adored Andi from our first meeting, and she continues to be one of those whatcom women I really look up to.